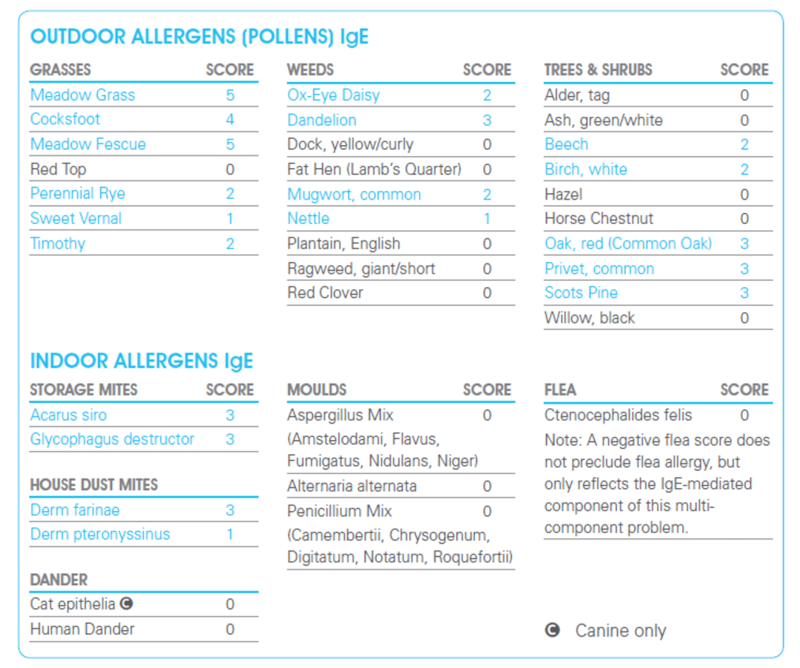 A serological test to aid in the diagnosis and management of environmental allergies. Results should always be interpreted in relation to the clinical history. In addition to the comprehensive environmental indoor and outdoor panels, an environmental indicator screen is available. The screen provides simple positive/negative results for grasses, weeds, trees and indoor panels, which can then be expanded to get full results if required. Every score of 1 and above is potentially significant. Variation of class score within an individual animal’s results is significant, but comparison between different animals is not. If the correct diagnostic work-up has been followed and relevant clinical signs are present, positive IgE scores are compatible with an atopic animal. In this example the highlighted allergens are potentially significant and should be interpreted alongside the clinical history. Avoidance – Our results packs give clear and practical detailed guidance of how to help with avoidance/reduce exposure to environmental allergens for which the animal has shown a hypersensitivity reaction. ASIT is a practical option where there are a number of clearly defined hypersensitivity responses. Studies show that between 50-80%1 of cases improve on ASIT and that concurrent therapies can often be reduced and in certain cases eliminated completely. ASIT can be ordered via Avacta Animal Health. For more information please download our educational immunotherapy leaflet. To allow us to process the order, a certificate (SIC) is required, which must be applied for by a veterinary surgeon through the VMD website. 1. Jackson, H.A. and Mueller, R.S. (2007). Atopic dermatitis and adverse food reactions. In: BSAVA Manual of Canine and Feline Dermatology, 3rd edn, ed. H.A. Jackson and R. Marsella, 130-140. BSAVA, Gloucester, UK.